No vacation is perfect, and this proved true as soon as we hit the interstate in the rental Chevy Malibu. We were heading from Sarasota to Naples on Interstate 75 and as we accelerated to cruising speed, the car started to shake pretty bad. I figured a tire was out of round or it was in sore need of an alignment. Either way, it was disconcerting to the point we were afraid maybe a wheel would come off. I Googled Avis locations in Naples, just 60 miles away, in hopes that we could swap out to another vehicle. The nice agent there said he didn’t have anything, but that we should go to Ft Myers International (only 10 miles away) pull in like we were returning the car, but request a replacement. Long story short, we did and so received a new Jeep Lattitude with only 817 miles on it. Should have no problems with that. Well, as soon as we pulled out of the garage we noticed a significant metallic rattle from under the rear end. At this point, I decided we would live with it – I wasn’t going back into the airport again. The Jeep performed fine the rest of the trip, save for the annoying rattle. In Naples, we stayed with good friend who just had a house built in a nice gated community. 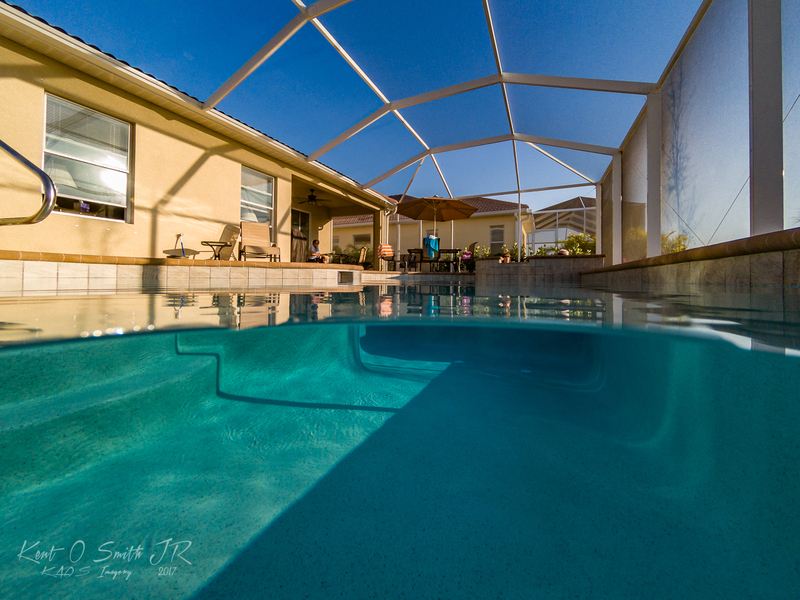 The have a beautiful screened in pool and hot tub area, The hot tub is on auto program to come on a 4 pm and reach full temp by 5 pm – it’s five o’clock somewhere, right? Many evenings were spent there. The pool was very inviting and allowed me to test out a new six inch dome housing for my GoPro Hero5. The camera fits into the housing and has a pistol grip style trigger to fire the shutter button. You submerse it half way to get those cool over and under style shots. Our friends used to rent on nearby Marco Island during winters past. The last house was on the water with a dock, so they brought their 24′ SeaRay down from New York and we would go on cocktail cruises or to the beach. This year, since the house was new and not on the water, no boat. But they did befriend the neighbor at the rental house who kindly took us for a lunch cruise on his boat, a larger SeaRay. The one day Captain Ron was able to go, it decided to be very windy, so our boating location options were limited. Captain Ron took us up the protected Marco River to Goodland where a well known waterhole named Stan’s Idle Hour was. 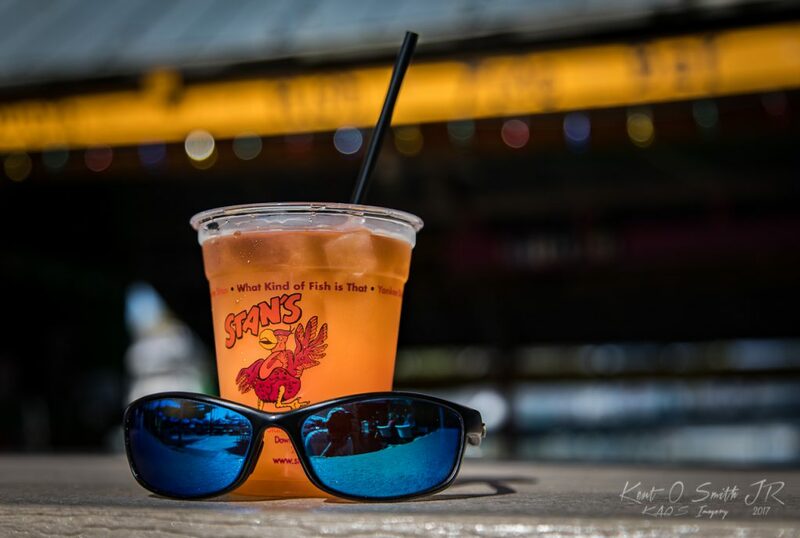 Shockingly, we had more grouper sandwiches and sampled Stan’s special Buzzard Punch that, well, really packed a punch if you drank a few. The following day, we decided to ride up to Sanibel Island, only about an hour away. It was a glorious blue sky kind of day and mid week, so we figured the traffic going to Sanibel wouldn’t be too bad. We figured wrong. A water main break by the causeway caused the first backup. But once on island, we encountered the snow bird traffic that is very heavy all of February and March. 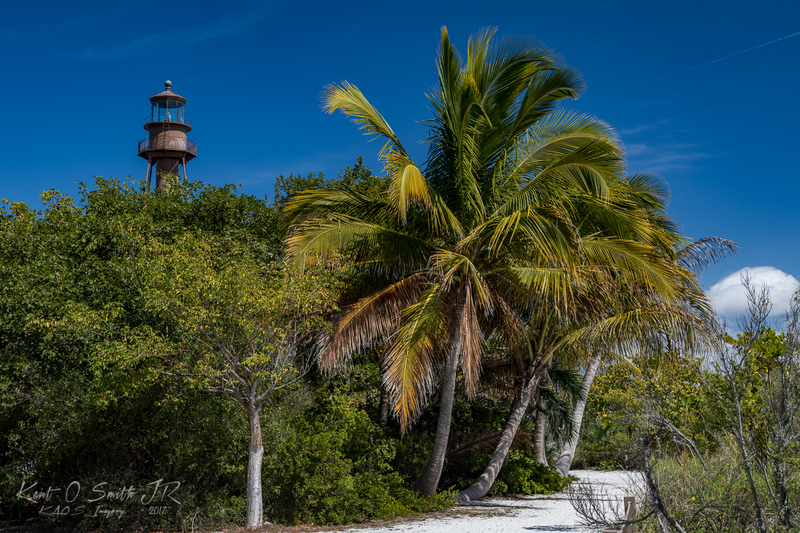 First stop was on the southern tip of the island to see the historic Sanibel lighthouse. Apparently, it was a popular spot for the day as not a single parking spot was to be had. Circling the lot a couple of times, we were able to grab one just as a fellow tourist was departing. The lighthouse is picturesque, though the sky wasn’t coopering with dramatic clouds, but the blue sky over the lush greenery was still nice. 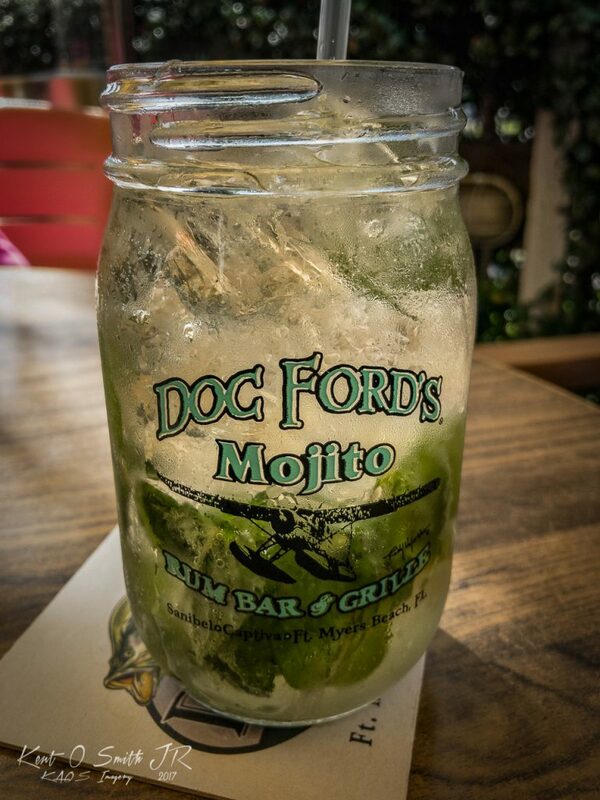 The ride and sightseeing made us hungry, so we pulled into Doc Ford’s Rum Bar to find yet another packed parking lot. You’d think it was tourist season or something. No one had the patience to deal with a wait for a table, so we continued north to Captiva in search of another tropical eatery. To our surprise, there is a new Doc Ford’s in Captiva, barely anyone in there, scored a table in the sun with zero wait. It’s a rum bar, how much trouble could we get in? Not too much, fortunately, though one has to sample some rum and the house mojito. Doc’s also had some killer hot & sweet wings and a nice take on Florida style fish sandwich. One of my best friends from high school lives in Naples and invited us to go kayaking. He and his wife had nice new Eddyline boats, but still had their old tandem sit on top that we could use. 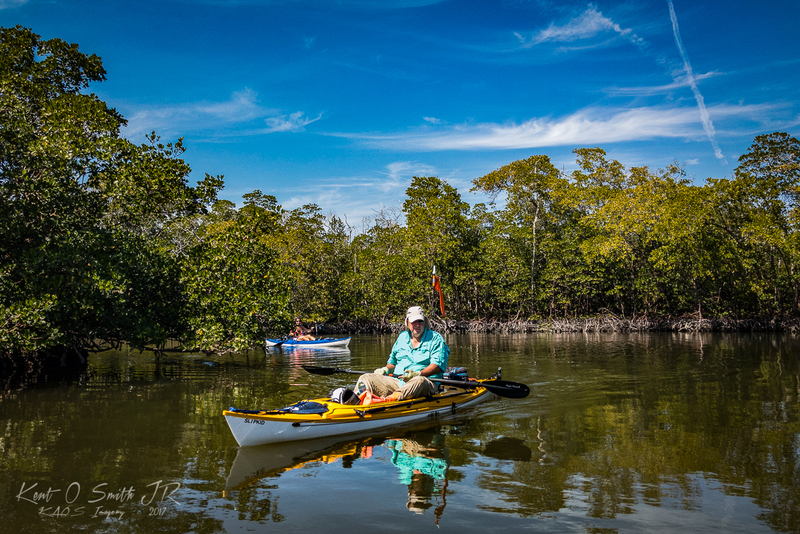 Glenn lead us on a tour of the backwaters of Rookery Bay, through mangrove tunnels and small creeks. Another perfect weather day and great day for a nautical picnic. We covered a good eight miles at leisurely pace and reminisced of old times. Cocktails back in the hot tub soothed the aches of paddling. 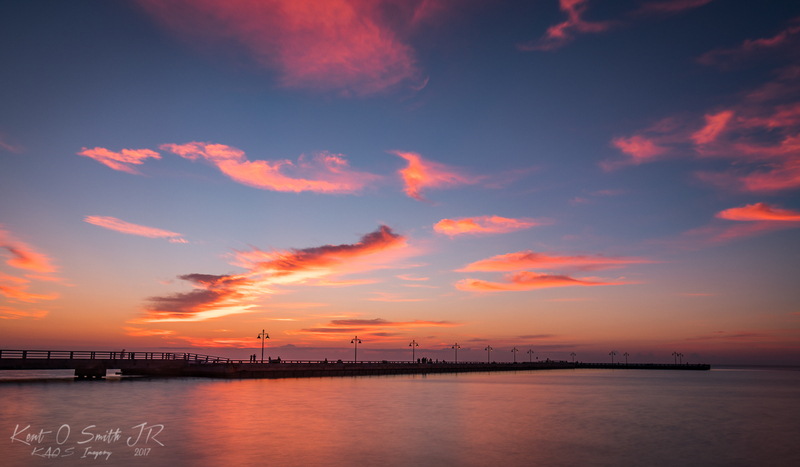 Our last day in Naples was very laid back, but I really wanted to shoot a sunset since I hadn’t since St Pete Beach. 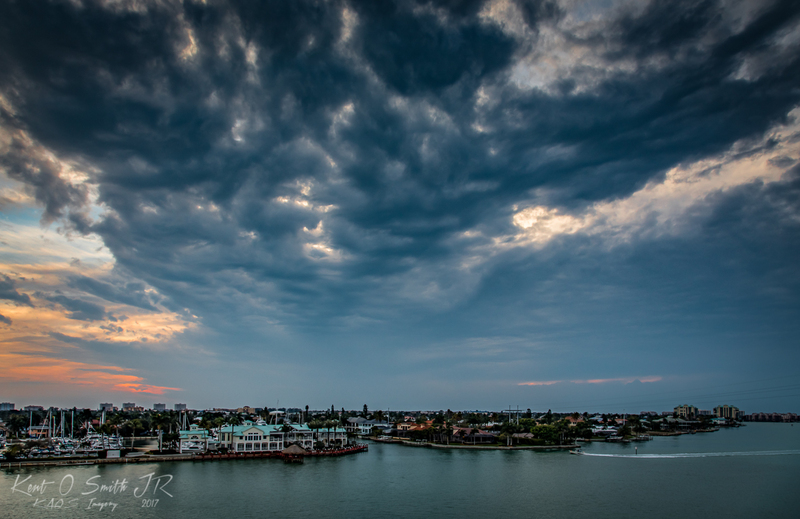 I decided it might be neat to shoot from the top of the Jolley Bridge, the causeway that connects Marco Island to the mainland. There is a nice sidewalk to the top as well as some benches. For once, the weather didn’t cooperate with clear skys. The wind blew in overcast clouds from the Gulf which muted the sunset, though I was still able to get an interesting shot in the gloom. Early the following morning, we departed for Key West. I hadn’t been there in 15 years or so and Marsha had never been there. We left in the wee hours so we could spend the second half of the morning enjoying the ride down the Keys. 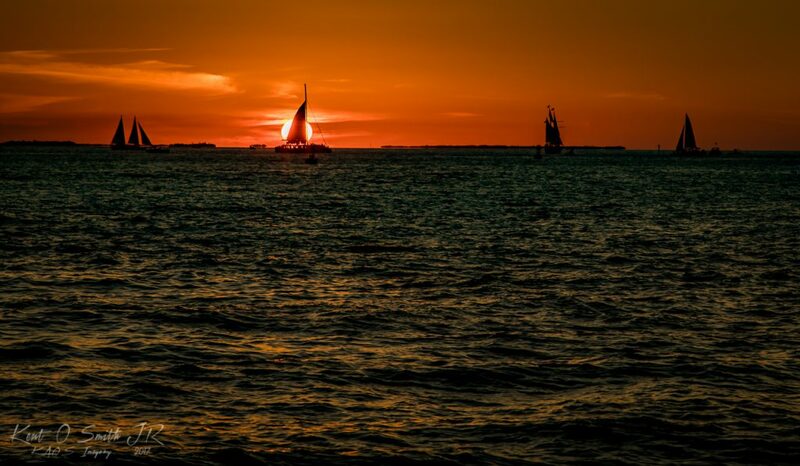 Weather was spectacular and we made beeline for Key West. Through AARP, I had secured a discounted room at the Best Western Hibiscus which was in old town and in walking distance from Mallory Square. Well, I guess 10% off the $350 a night room is “discounted” to a degree, but still crazy pricing. We dumped the Jeep in the parking lot and went in search of lunch. Key West is a tourist town, so when in Rome…well, you do the tourist thing and sight see. That we did, planning on being in Mallory Square for the sunset. On the way, I had to check out Kelly’s Caribbean, which supposedly has one of the best happy hours in KW. Kelly’s is owned by actress Kelly McGillis who was in Top Gun with Tom Cruise. Her leather bomber jacket is on display there, the bar is made from riveted aluminum that looks like an airplane wing. Good theme, the building is historic, it’s where Pan Am airlines was started. Did I mention margaritas were $3 for happy hour? Just enough to prime us for the sunset. Being a Sunday eve, Mallory Square was more subdued than I recall. There were still a number of street performers and a crowd, but it didn’t seem overcrowded. The sunset was decent, not over the top, but enjoyable just the same. If you ever go to KW, you have to experience Mallory Square just once. Despite a night on the town and being on vacation, I decided to get up early and shoot the sunrise. 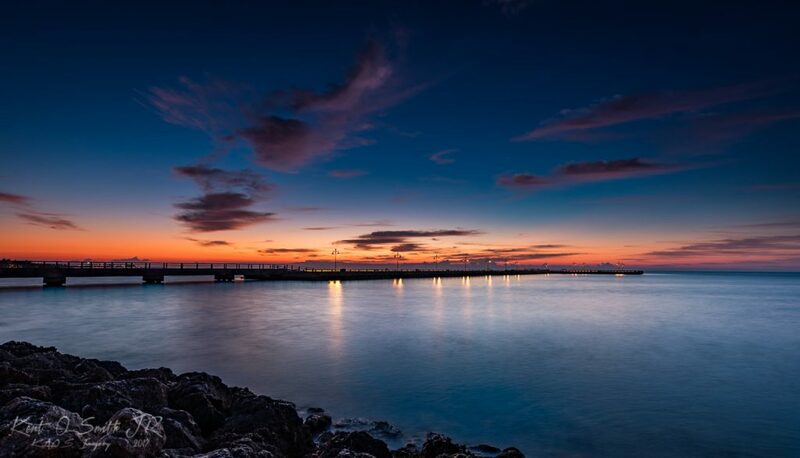 I scouted a location at a fishing pier that was just a mile or so from our hotel, the sun should rise behind the pier. Arriving on scene an hour before the sunrise, I had time to hone in on a final spot to set up the tripod. The pre dawn was nicer than the sunrise itself. I shot a number of frames with reverse ND filter where the darkest part of the filter is in the middle of the glass, made just for sunset / sunrise photos with simple horizon lines. Nearing sunrise, for some odd reason, my three month old 5D Mark IV decided to take nap and not wake up. Changing batteries didn’t help, it just wouldn’t turn on. Fortunately, I had my Mark III with me as backup, and was able to take many more photos during the rest of the trip. Interesting enough, the Mark IV came back to life when I returned home…and there was a firmware update to apply, it’s been behaving well since. After the morning’s adventure, we meandered north at a slow pace towards Key Largo. There were a number of off the path locations as well as main attractions that I wanted to stop at. One was a bat tower constructed in the 1920s to house bats who were supposed to help with the local bug problem. The bats didn’t take to the tower, and the tower wasn’t really anything special to see, so we explored further out that road that ended at a small airstrip used for parachuting. 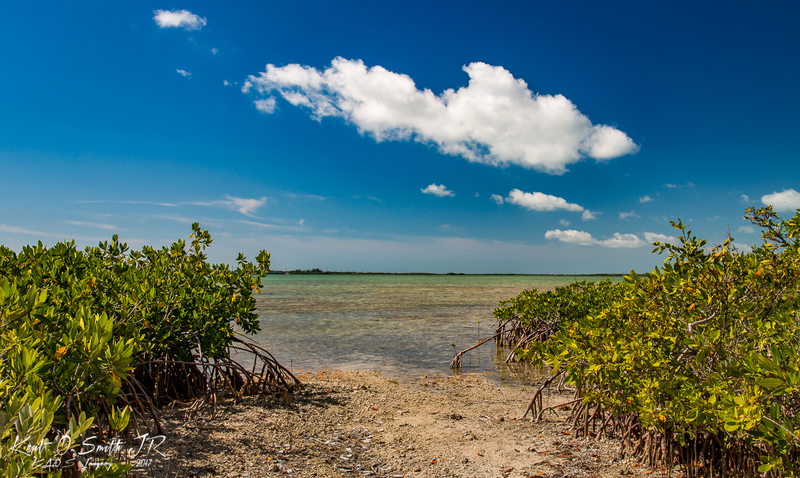 Before turning around, I noticed a small beach head between mangroves and got out to shoot this iconic Florida Keys scene. Next stop was the old railroad bridge by Bahia Honda. We chose the south end due to the sunlight at the time. It was fascinating to see the rusty old structure framed by the blue green waters. 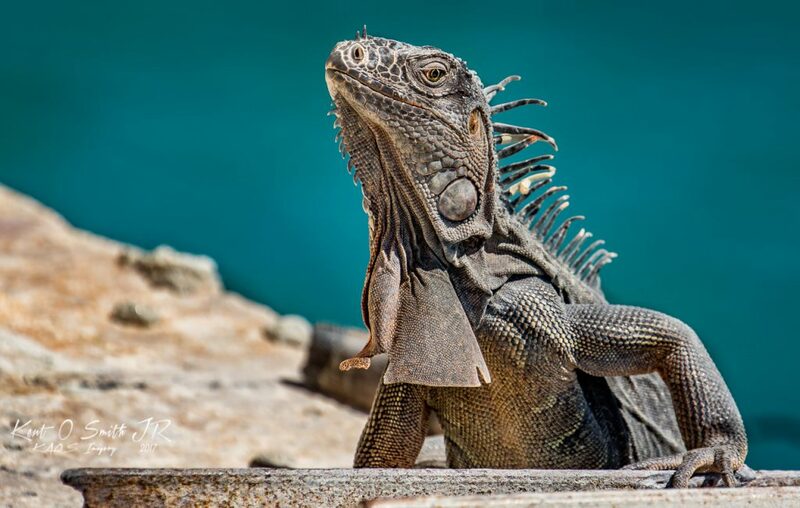 While searching for both high and low vantage points, I came across an iguana enjoying the midday sun who obligingly posed for his portrait. Bahia Honda Park has a very nice beach, so we pulled in there for a snorkeling swim, though it was too rough to try out the GoPro dome. Continuing on, I found a nice little town park in Marathon called Sombrero Beach. It was rather crowded, a nice locale with calm waters, white sands, and plethora of palm trees. Our friends in Naples go by the handle “twopalms” and I noticed two palms with some great side sunlight. The problem was I could see the heads of people standing on the beach. I changed my perspective by crouching down, which made the beach grass block the people on the beach and made this nice image of Two Palms, which I later had printed, framed and shipped to our pals in Naples. Near starving by late afternoon, we located a local seafood joint in Marathon for a beer and a bite. 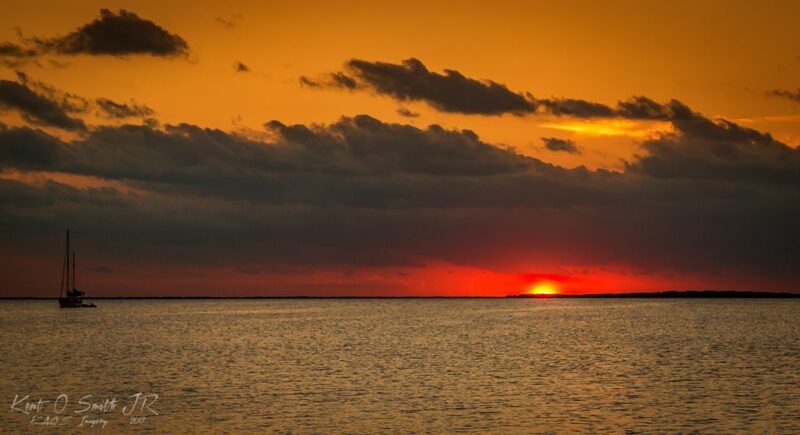 Then it was on to the hotel in Key Largo, which was on Blackwater Sound, a body of water with western exposure that could be good for a sunset. As we neared the destination, the traffic increased exponentially. Would we make it in time? Marsha drove while I kept an eye on the sky and the time. Fortunately, we arrived a half hour before sunset, but there was a line at check in…the clock ticked…but we made it to the shoreline about ten minutes before the muted sun set behind a small wall of clouds. 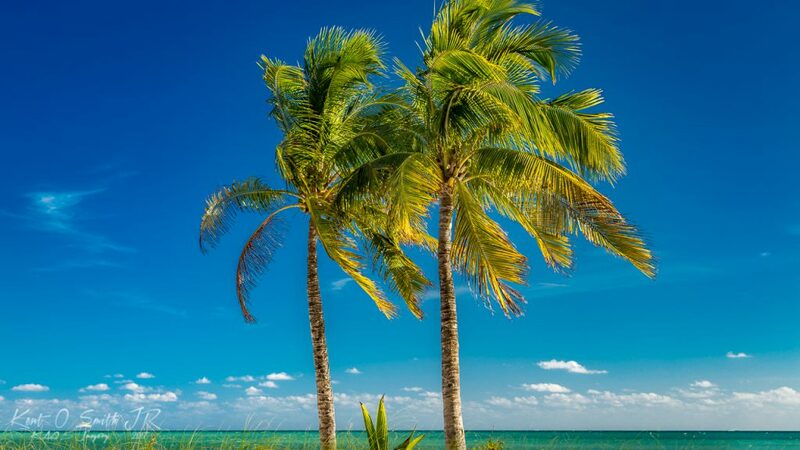 Our last full day in Florida was spent relaxing, meeting a client who wintered in Key Largo for lunch, and traveling to Ft Lauderdale where we would fly out of the following morning. As we neared Lauderdale, the cloud cover increased. 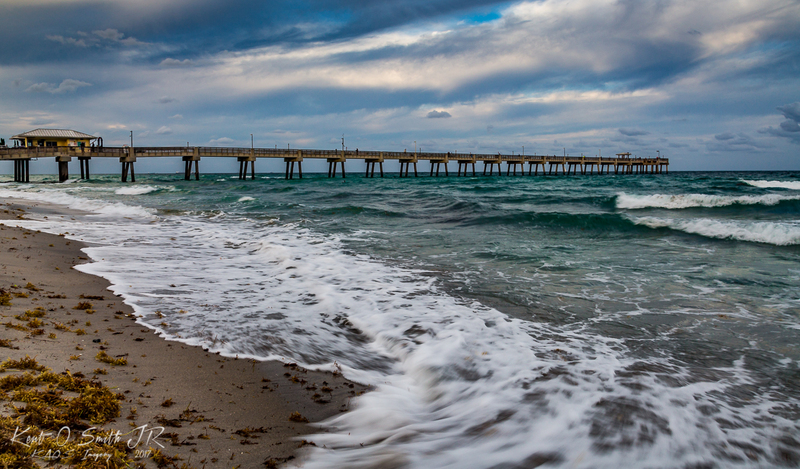 After we checked in at our motel, we headed to Dania Beach for a walk on the pier and a beer at the tiki bar. With the breeze, it was almost chilly compared to the weather we had been experiencing, but still much nicer than back home. The grey overcast view mimicked our feelings as our vacation was quickly coming to an end. My attempt at trying to balance vacation and some photography was overall successful. In retrospect, I wish I spend more time on those southern photography pursuits, but I am very grateful for a fun and relaxing time as well.